PALO ALTO, Calif., March 15 (SEND2PRESS NEWSWIRE) — Virtual Law Partners LLP is very pleased to announce the expansion of its Intellectual Property practice with the addition of Dr. Linda Rost as a partner. Dr. Rost joins VLP from the Silicon Valley office of Ropes & Gray where she represented clients in the pharmaceutical, biotechnology, medical device, and high tech industries. Dr. Rost’s practice focuses on pre-litigation and litigation counseling related to a wide variety of intellectual property issues. She specializes in international strategy, patent analysis, and litigation risk management. Dr. Rost has extensive experience in patent litigation, having practiced at the district court and appellate levels for over ten years. She has also litigated and counseled clients on trade secret disputes, written patent opinion letters, and helped to coordinate international patent enforcement efforts for a multi-billion dollar pharmaceutical company. Dr. Rost is a graduate of Stanford Law School, where she was managing editor of the Stanford Technology Law Review. Prior to her legal career, Dr. Rost graduated from the University of Colorado with a double major in Biochemistry and Molecular, Cellular, and Developmental Biology. She then obtained a Ph.D. in Molecular and Cell Biology from Brandeis University. As a scientist, Dr. Rost has worked as a structural molecular biologist, employing extensive computer modeling, as a developmental biologist, and as a chemist, working in natural product isolation. VLP’s Intellectual Property practice is dedicated to providing the best protection for our clients’ intellectual property at the most cost-effective rates available. Our attorneys and staff provide services directed to meeting the particular needs and stage of development of our clients across a range of industries, including biotechnology, high technology, clean technology, pharmaceuticals, medical devices, software and other cutting edge technologies. We provide counseling, strategic advice and specific protection in all areas of intellectual property, including patent, trademark, copyright, and trade secret. VLP is a general business and transactional law firm that delivers top quality, efficient and cost-effective legal services. Our practice reaches across multiple industry sectors, including high tech, life sciences, intellectual property, angel and venture capital financings, clean tech, insurance, tax, commercial lending and real estate. We represent clients that vary in size from early-stage startups to Fortune 500 companies, and our client base includes private and public corporations, venture capital and private equity funds, educational institutions, nonprofit organizations and individuals. By eliminating central offices and other unnecessary expenses, we cut our overhead and offer compelling rates. VLP is based on the core values of excellence, efficiency and innovation, and we pride ourselves on being at the cutting edge of the changing legal profession. 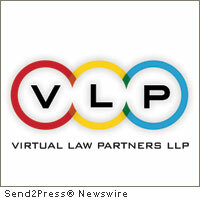 For more information about VLP, visit www.virtuallawpartners.com . Original Keywords: Intellectual Property Practice, VLP, Virtual Law Partners, Linda Rost, international patent enforcement, California business news, David Roise, trade secret disputes, written patent opinion letters Virtual Law Partners LLP Palo Alto California PALO ALTO, Calif.
VLP is a business and transactional law firm that delivers top quality, efficient and cost-effective legal services. Our practice reaches across many industry sectors, including high tech, life sciences, angel and venture capital financings, clean tech, insurance, retail, consumer product, commercial lending and real estate. We represent clients that vary in size from early-stage startups to Fortune 500 companies. Our client base includes public and private corporations, venture capital investors, private equity funds, educational institutions, nonprofits and individuals. REFERENCES: Business News, Intellectual Property Practice, VLP, Virtual Law Partners, Linda Rost, international patent enforcement, California business news, David Roise, trade secret disputes, written patent opinion letters Virtual Law Partners LLP Palo Alto California PALO ALTO, Calif.